This compendium of important insights from sixty distinguished international scholars looks at the significant advances in progressive environmental technology—especially the molecular engineering used on plants, animals, and microorganisms—as the game changer in the high-stakes race to reverse earth-damaging practices. Biocatalysis and Biomolecular Engineering builds a cohesive, well thought out case for nurturing new discoveries in eco-technology by inviting critical discussion on devising viable solutions to sustaining the future wellness of humankind. Ching T. Hou is the lead scientist at the USDA National Center for Agricultural Utilization Research in Peoria, Illinois, since 1989. He is President of the International Society of Biocatalysis and Biotechnology. He is a Fellow of the American Academy of Microbiology, the Society of Industrial Microbiology, and the American Oil Chemists' Society, holds seventeen patents, and has published over 220 peer-reviewed journal papers and five books. Jei-Fu Shaw, PhD, is President and Chair Professor at National Chung Hsing University, Taichung, Taiwan. Dr. Shaw received the Biotechnology Lifetime Achievement Award of the American Oil Chemists' Society in 2005 and was elected a Fellow of the American Association for the Advancement of Science (AAAS) in 2006. He has published over 150 international SCI papers and holds seven patents. Section I. Improvement of Agronomic and Microbial Traits. 1.Insights into the Structure and Function of Acyl-CoA: Diacylglycerol Acyltransferase (Rodrigo M.P. Siloto, Qin Liu, Randall J. Weselake, Xiaohua He, and Thomas McKeon). 2. Improving Enzyme Character by Molecular Breeding: Preparation of Chimeric Genes (Kiyoshi Hayashi, Motomitsu Kitaoka, and Mamoru Nishimoto). 3. Production and Accumulation of Unusual Fatty Acids in Plant Tissues (D. Hildebrand, J.R, Thoguru, S. Rao, R Li, and T. Hatanaka). 4. Preparation of Oleaginous Yeast by Genetic Modification and Its Potential Applications (Yasushi Kamisaka). 5. Improving Value of Oil Palm Using Genetic Engineering (Ghulam Kadir Admad Parveez, Abrizah Othman, Umi Salamah Ramli, Ravigadevi Sambanthamurthi, Abdul Masani Mat Yunus, Ahmad Tarmizi Hashim, Ahmad Kushairi Din, and Mohd Basri Wahid). 6. Potential in Using Arabidopsis Acyl-Coenzyme-A-Binding Proteins in Engineering Stress-Tolerant Plants (Mee-Len Chye, Shi Xiao, Qin-Fang Chen, and Wei Gao). 7. Modification of Lipid Composition by Genetic Engineering in Oleaginous Marine Microorganism, Thraustochytrid (Tsunehiro Aki, Hiroaki Iwasaka, Hirofumi Adachi, Maya Nanko, Hiroko Kawasaki, Seiji Kawamoto, Toshihide Kakizono, and Kazuhisa Ono). 8. Integrated Approaches to Manage Tomato Yellow Leaf Curl Viruses (R. C, de la Peña, P. Kadirvel, S. Venkatesan, L. Kenyon, and J. Hughes). 9. Carbohydrate Acquisition During Legume Seed Development (Jocelyn A. Ozga, Dennis M. Reinecke, and Pankaj K. Bhowmik). 10. Biotechnology Enhancement of Phytosterol Biosynthesis in Seed Oils (Qilin Chen and Jitao Zou). Section II: Functional Foods and Biofuels. 11. Dietary Phosphatidylinositol in Metabolic Syndrome (Bungo Shirouchi, Koji Nagao, and Teruyoshi Yanagita). 12. Biotechnological Enrichment of Cereals with Polyunsaturated Fatty Acids (Milan Certik, Zuzana Adamechova, and Lucia Slavikova). 13. Lipophilic Ginsenoside Derivatives Production (Jiang-Ning Hu and Ki-Teak Lee). 14. Brown Seaweed Lipids as Possible Source for Nutraceuticals and Functonal Foods (M. Airanthi K. Widjaja-Adhi, Takayuki Tsukui, Masashi Hosokawa, and Kazuo Miysahita). 15. Processes for Production of Biodiesel Fuel (Yomi Watanabe and Yuji Shimada). 16. Noncatalytic Alcoholysis Process for Production of Biodiesel Fuel: Its Potential in Japan and Southeast Asia (Hiroshi Nabetani, Shoji Hagiwara, and Mitsutoshi Nakajima). 17. Use of Coniochaeta ligniaria to Detoxify Fermentation Inhibitors Present in Cellulosic Sugar Streams (Nancy N. Nichols, Bruce S. Dien, Maria J. López, and Joaquín Moreno). 18. 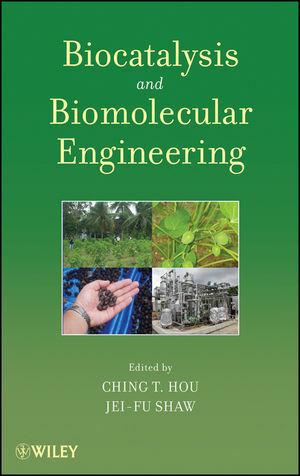 Omics Applications to Biofuel Research (Tzi-Yuan Wang, Hsin-Liang Chen, Wen-Hsiung Li, Huang-Mo Sung, and Ming-Che Shih). 19. Biotechnological Uses of Phospholipids (Jeong Jun Han, Jae Kwang Song, Joon Shick Rhee, and Suk Hoo Yoon). 20. Application of Partition Chromatographic Theory on the Routine Analysis of Lipid Molecular Species (Koretaro Takahashi and Tsugihiko Hirano). 21. Dehydrogenase-Catalyzed Synthesis of Chiral Intermediates for Drugs (Ramesh N. Patel). 22. Engineering of Bacterial Cycochrome P450 Monooxygenase as Biocatalysts for Chemical Synthesis and Environmental Bioremedication (Jun Ogawa, Quin-Shan Li, Sakayu Shimizu, Vlada Urlancher, and Rolf D. Schmid). 23. Glycosynthases from Inverting Hydrolases (Motomitsu Kitaoka). 24. Molecular Species of Diacylglycerols and Triacylglycerols Containing Dihydroxy Fatty Acids in Castor Oil (Jiann-Tsyh Lin). 25. Biocatalytic Production of Lactobionic Acid (Hirofumi Nakano, Takaaki Kiryu, Taro Kiso, and Hiromi Murakami). 26. Recent Advances in Aldolase-Catalyzed Synthesis of Unnatural Sugars and Iminocyclitols (Masakazu Sugiyama, Zhangyong Hong, William A. Greenberg, and Chi-Huey Wong). 27, Production of Value-Added Products by Lactic Acid Bacteria (Siqing Liu, Kenneth M. Bischoff, Yebo Li, Fengjie Cui, Hassan Azaizeh, and Ahmed Tafesh). 28. Enzymatic Synthesis of Glycosides Using Alpha-Amylase Family Enzymes (Kazuhisa Sugimoto, Takahisa Nishimura, Koji Nomura, Hiromi Nishiura, and Takashi Kuriki). 29. Biological Synthesis of Gold and Silver Nanoparticles Using Plant Leaf Extracts and Antimicrobial Application (Beom Soo Kim and Jae Yong Song). 30. Potential Approach of Microbial Conversion to Develop New Antifungal Products of Omega-3 Fatty Acids (Vivek K. Bajpai, Sun-Chul Kang, Hak-Ryul Kim, and Ching T. Hou).